Tracy at Amuse Bouche for Two introduced The Mistah and I to these Flourless Peanut Butter Cookies. I think you ought to make their acquaintance as well. The Mistah said, “I’ve had peanut butter cookies before and these are GOOD. Rich, but not too rich. That’s it. I’m a man of few words.” Yeah, especially when he’s got a cookie in his mouth. Thirty minutes, a short list of ingredients, and you’ll understand what all the fuss is about. Heat oven to 350 degrees and line two sheet pans with parchment. Place all ingredients in the bowl of a stand mixer fitted with a paddle attachment. Mix on low speed until completely combined. Using a small ice cream scoop, place six, 1 tablespoon portions of dough, spaced approximately 2 inches apart, on a prepared pan. Use a fork to press each portion of dough down into a round. Bake for approximately 12 minutes until the cookies puff slightly, the bottom and edges are set but the center is still soft to the touch. Cool on the pan for 5 minutes then transfer to a rack to cool completely. Since I rarely have flour on hand (I don’t bake, you know) I’m printing this out for the times when the girls want to bake and I’ve got zippo! Thanks, Wendi! Kitch, I’ll get you baking yet. And really, all thanks, kudos, and shout outs should praise Tracy @ Amuse Bouche for Two. Her post inspired me to make these. 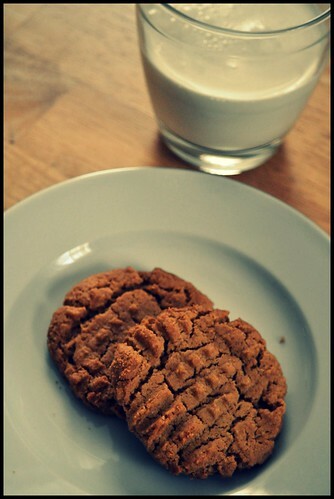 I love all thing peanut butter, especially cookies. I needs. Boo, you can have these beauties in a jiffy. Tracy, you have no idea how much we LOVED these cookies. They are perfect with a cold glass of milk. These cookies look like they would be like crack in our house, especially for Noel! Beth, if one has a peanut butter addiction, these would qualify as cracktastic! these look delicious! So delicious I have a batch in the oven right now 🙂 Thanks for sharing! Victoria, I hope you will let me know how you like them. I think they would make a lovely snack while you read Wuthering Heights. I have to make these! I love peanut butter – I eat a jar a week – so these cookies would be perfect. Do they have a stronger peanut butter flavor without the flour? Can’t wait to try the recipe! Jen, I’d say that the cookies have a nice balanced peanut butter flavor. If you make them, please let me know what you think. I guess you could say we both have a PB addiction–since we both eat it every single day for lunch (even during our recent vacation). But Noel is way more addicted to the sweet peanut butter–Reeses cups for example, do not stand a chance in our house. Beth, I’ve got a buckeye post coming up in the next few weeks. From what you say, I think it would be a hit with you and Noel. And I printed out your homemade pb cup recipe. Because I know that would be a hit with The Mistah and me. Victoria, I love hearing these were a hit. And isn’t it silly how easy they are to make?